Just because a machine is a powerful workstation doesn’t mean it has to be big and bulky. In fact, you can get a lot of power and speed in a small form, thanks to the new mini tower and small form factor designs of the Dell Precision Tower 3620. The standard tower is still available as well if you have enough space for it and want to add multiple hard drives. The SFF tower is the most compact small form factor design in the industry, and the mini tower still has enough room for expansion as your business requirements grow. This is a nice looking workstation with its “utilitarian” design. The chassis is matte black and the front portion of the case features a grille. The small form factor version is 11.42-inches high, 3.65-inches wide, and 11.5-inches in depth. Its weight starts at just 11.68-lbs. The measurements of the mini tower are 14.17 x 6.89 x 12.17-inches (H x W x D). 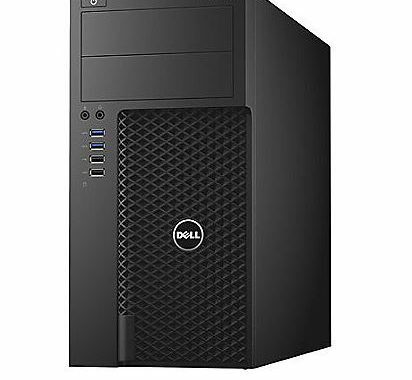 There are a number of hardware certifications that come with the Dell Precision Tower 3620 to ensure its quality and performance. Dell ISV certifications cover a variety of software applications as well, as the company partners with other industry-leading IT companies to solve today’s most complex problems of computing. Another great feature that is available with this workstation is the Precision Optimizer. Since different applications have different system requirements in order to run smoothly, the Optimizer takes all of the guesswork out of customizing settings. The technology works together with SCCM centralized management for the purpose of automatically tuning the computer to run popular ISV applications at the ideal speed, therefore enhancing productivity. There is room for multiple hard drives (up to 5 in the standard, large tower), so you can easily add as much storage as you want. All types of drives, including SSDs, run well in this machine. While no optical drive is included, you can add one to your order if you want a DVD or Blu-Ray drive. However, the optical drive is only an option on the SFF tower and not the mini tower. If integrated graphics are not enough, you can go with an AMD-single, nVIDIA single, or even a DUAL set up for extra graphics power. No matter which version of the Dell Precision Tower 3620 you choose, this workstation comes with a variety of USB ports, a Display Port, HDMI, line-out connector, and more. This Dell Precision Tower 3620 review covered a lot of what the computer has to offer. However, there is still more to learn about it, including how to save money when buying it online. There are Dell promotional codes and coupons for you to look over if you want to get a great deal.